Alberta Open Farm Days visitors have even more opportunities to harvest family fun and discover Alberta’s hidden gems on Aug. 19 and 20. A bumper crop of family-friendly fun activities awaits as farmers, ranchers and ag-tourism operators invite visitors to experience informative tours and culinary events that help highlight the importance of agriculture to the province. This year, there are more than 100 Alberta Open Farm Days host sites and over 20 culinary events across Alberta. For the first time, and based on popular demand, culinary events and open houses will take place on both Saturday and Sunday. This change makes it even easier for visitors to experience more of what Alberta Open Farm Days has to offer. Farmers and ranchers will open their doors and welcome visitors at farms across the province. They will offer educational tours, opportunities to buy locally grown and made products and activities like hayrides and petting zoos. Admission to farms is free, but there may be costs for some activities. Top Alberta chefs will be featured at one-of-a-kind culinary events as they prepare dishes using locally grown products. There is a range of costs to participate in the culinary events. Be sure to plan ahead as some events sell out. Visit the Alberta Open Farm Days website for details, including a full listing of culinary events and participating farms. Be sure to use the helpful trip-planning tool to chart your Alberta Open Farm Days road trip. 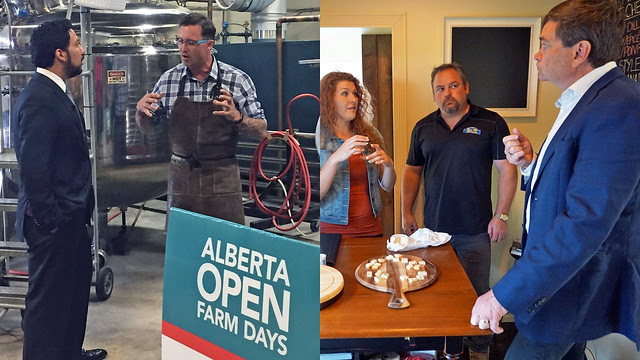 Alberta Open Farms Days, which began in 2012, is a collaborative project presented by the Government of Alberta, Ag for Life, the Alberta Association of Agricultural Societies, Travel Alberta and participating farms, ranches and agricultural societies.